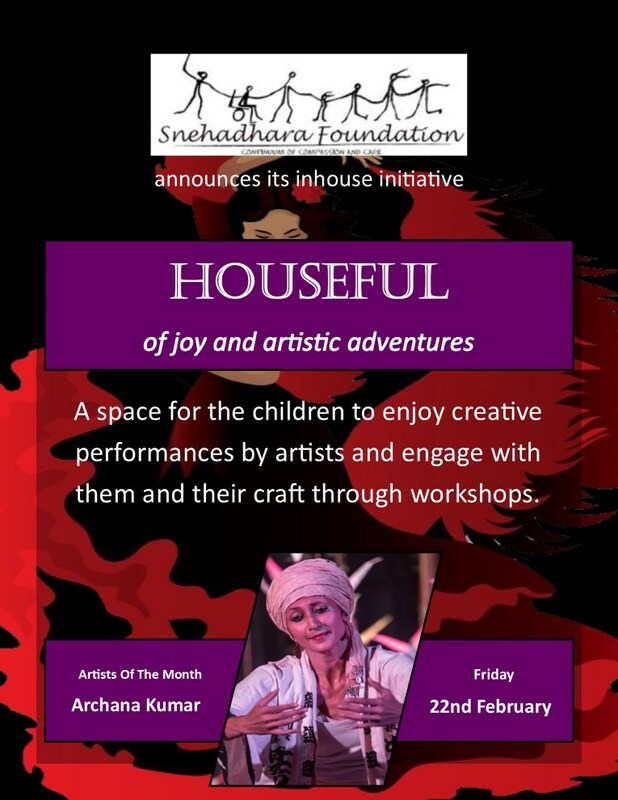 We continue our journey of creativity in February with our next ‘Houseful’ event where we invite artists to explore artistic spaces with us through their craft. Our guest this month is Archana Kumar. Archana Kumar is an independent performing artist, who prefers to speak the uncomfortable truths. Her work is bold, evocative and radical. Her decade long residence in USA carved most of her foundational training in modern dance, physical theatre and improvisation. Her artistic journey began with Kathak, which she continues to actively teach (history: led a premier Kathak school in Seattle, was adjunct faculty at Cornish college of arts, Seattle & Northwestern Univ, Evanston) She owes much of her Theatre experience to her mentor , Hiroshi Ohashi of the Proto Theatre, Tokyo ( since 2005). At this very moment – she’s been exploring and introducing Kathak’s daughter, Flamenco to Bangalore, through her Flamenco Ensemble, workshops and teaching at a school .